Disney has been on a role with their live action remakes of old classic cartoons and the Jungle Book it is a testament of how far technology has come to make it all possible. First it was Maleficent and then it was Cinderella and with those two being surprisingly well shot and with beautiful imagery, I did not even think this flick was gonna be anything short of amazing as well. We all know the classic animation of Jungle Book and let me tell you this right now, it follows that storyline so closely that you'd think it was the same but with live action. The story was altered just a little, but nothing to complain about. I know I sometimes say some movies add too much CGI that it looks fake but I read an article where for the animals they went out and actually followed animal movements and behaviors to mimic in the movie and make it as real as possible. Sure, animals do not talk but everything else looked so real and it was so well shot it did not bother me. Again Disney has outdone themselves with this one, good job! 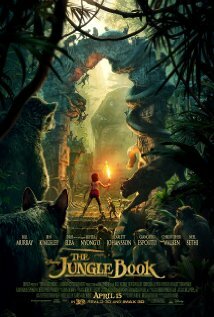 Mowgli (Neel Sethi) — who by the way did an outstanding job playing the key character — has been raised by wolves since he was a very young child. He was brought to the wolves by a Panther named Bagheera (voiced by Ben Kingsley) where the panther knew Mowgli would be protected. He is raised by RakSha (voiced by Lupita Nyong'o) and the rest of the pack. He gets older and is threatened by the evil tiger Shere Khan (voiced by Idris Elba) so to protect his wolf family, Mowgli leaves with Bagheera to return to his own kind. On his journey he meets the hypnotizing snake Kaa (voiced by Scarlett Johansson), the giant Orangutan King Louie (voiced by Christopher Walken) who "wants to be like you." We also can't forget the con but later very good friend who "looks for the bare Necessities" bear, Baloo (voiced by Bill Murray). He meets a lot of animals on his journey to the man village but with Shere Khan on the hunt for Mowgli, they boy has to go back and face him head on. The story is well put together and very entertaining. You will not be disappointed, it is a great family film and will bring back childhood memories. You are in for a treat.